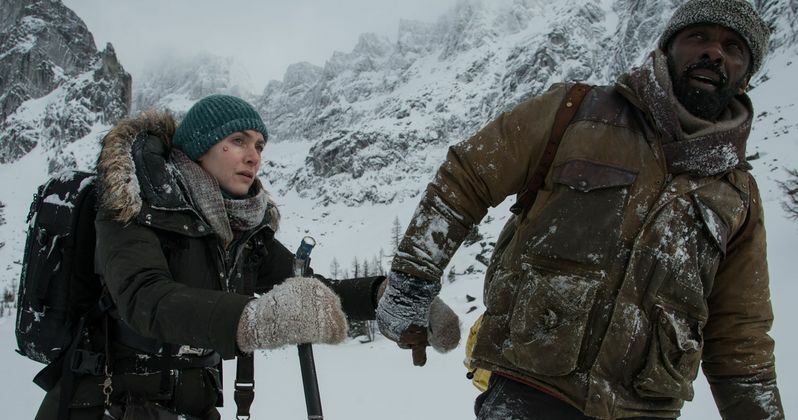 20th Century Fox has released the first trailer and photos for The Mountain Between Us, directed by Academy Award nominee Hany Abu-Assad and starring Academy Award winner Kate Winslet and Golden Globe winner Idris Elba. The trailer and these new images highlight the harrowing journey two strangers go on, which begins after they find themselves stranded at an Idaho airport. While they have very little in common, these two will soon learn to depend on each other to survive. Stranded after a tragic plane crash, two strangers must forge a connection to survive the extreme elements of a remote snow covered mountain. When they realize help is not coming, they embark on a perilous journey across hundreds of miles of wilderness, pushing one another to endure and discovering strength they never knew possible. This trailer, which debuted on 20th Century Fox YouTube, shows that these strangers Ben (Idris Elba) the doctor and Alex (Kate Winslet) the journalist, meet after their planes are delayed. Since Ben has to be in Baltimore to perform an emergency surgery, and Alex is getting married on the same day, Alex suggests that they both charter a plane, but when that plane crashes in the mountains, these strangers must depend on each other to survive. Ben argues that if they leave and try to escape these harsh conditions on their own, the search and rescue teams may miss them, but we also learn a harsh truth in the trailer. Since the pilot never filed a flight plan, no one will come looking for them, which means they have to strike out on their own. The supporting cast includes Beau Bridges, Dermot Mulroney, Lucia Walters, Waleed Zuaiter and Lee Majdoub. As of now, the October 20 weekend is certainly the most crowded frame of the year, with a whopping seven movies opening in wide release, just one shy of the record eight movies that opened on that same frame, the third weekend in October, in 2007. Opening against The Mountain Between Us is Warner Bros.' Geostorm, Sony's Granite Mountain Hotshots, PureFlix's Same Kind of Different as Me, Universal's The Snowman, Lionsgate's Tyler Perry's Boo 2! A Madea Halloween and The Weinstein Company's War With Grandpa. Hany Abu-Assad, who directed the Oscar-nominated film Paradise Now, directs from a screenplay by Chris Weitz (Rogue One: A Star Wars Story) and J. Mills Goodloe (The Age of Adaline), based on the critically-acclaimed novel by Charles Martin. Peter Chernin and Jenno Topping produce alongside David Ready and Dylan Clark. While it's possible that the crowded box office weekend could thin out between now and October 20, all of the movies opening on that date are vastly different from one another, so it will be interesting to see which one comes out on top. While we wait for more on The Mountain Between Us, take a look at the first trailer and photos below.